The pecking order in UFC’s talented welterweight division gets a little muddy after its two elite fighters Josh Koscheck and champion Georges St-Pierre. With former top contenders Jon Fitch and Thiago Alves doing battle this Saturday at UFC 117 and Martin Kampmann meeting newcomer Jake Shields at UFC 121, the logjam atop of the 170-pound totem pole has never been more congested. When the Fitch vs. Alves rematch was initially signed last December, and then again in March, it was assumed the winner would emerge as the No. 1 contender to the division’s crown. Unfortunately, neither of those two bouts ever took place after Alves suffered a knee injury prior to UFC 107 and then failed a pre-fight CT Scan just days before UFC 111. “I have not been told anything like that. I think with the addition of Jake Shields to the roster, I think there’s a strong possibility that the winner of [my fight with Alves] could get the winner of Kampmann/Shields. 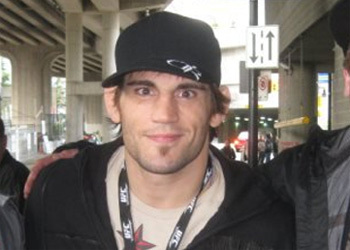 That’s what I’m hoping for,” Fitch frankly told MMAFighting.com. The reason Fitch is hoping for this scenario is because there’s also a strong possibility that Shields could get an immediate title shot if he trounces the gritty Kampmann. That’s something that wouldn’t please the American Kickboxing Academy trained fighter in the slightest. Well, the only problem with this fight is that Alves appears to be struggling once again to make weight. It was reported that his no-showed at yesterday’s UFC 117 open media workouts was so he could concentrate on hitting his mark at Friday’s official weigh-ins. “I just found out that he’s struggling with some weight right now. It’s laughable. I mean he’s still got plenty of time so I’m not worried, but with everything that’s happened around this fight, I can’t get anymore stressed about it,” stated Fitch. Complications for making weight is nothing new to Alves, who has been suspended in the past for taking a diuretic to help him lose excess pounds. The American Top Team stud also missed the mark by an astonishing four pounds for his UFC 85 contest against Matt Hughes. The former champ had no choice but to accept a catchweight bout. “He’s had issues in his past with making weight and he’s had a long layoff. We knew that there was a possibility that he was going to be overweight for this fight,” Fitch explained.